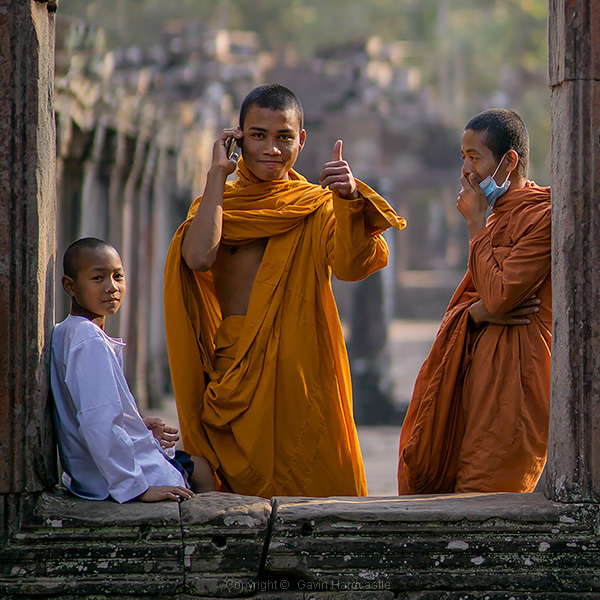 Get the most out of your travel photography and capture the moment with these 10 simple tips. Most of these tips are pretty basic and some of them are useful for traveling in general. Sounds obvious I know, but whether it’s wildlife or people, it’s often best to focus your lens on the face of of your most important subject. We are naturally drawn to eyes, so that’s where you’ll usually want to focus. Photographing people in fascinating cultural situations requires a totally different mindset to shooting landscapes. Forget your tripod, forget low ISO settings and think less about image quality and more about capturing the moment. Be ready, by relying on your autofocus and fast shutter speeds to freeze the action. Handheld is the way to go because you just don’t have the time to be fiddling around with tripods. In bright sunlight you’ll get away with ISO settings between 400 and 1000 but when the light starts to get low, don’t be afraid to crank that ISO way up into the thousands. Use wider apertures like f/2.8 to achieve faster shutter speeds and get a pleasing shallow depth of field to accentuate your main subject. Shooting in Aperture Priority mode (AV) lets you quickly dial in the desired aperture while your camera decides on the shutter speed. If your lens has some kind of vibration reduction be sure to switch that on when going handheld. Take at least a few hours while traveling to learn the basic language skills for your location. Knowing how to say ”Hello, excuse me, please, thank you, sorry, yes, no,” etc., goes a long way even in countries where English is spoken in tourist areas. Having some basic language skills can make a huge difference to the type of access you’ll get, and the things you’ll get to see. Language opens doors that would otherwise be closed to the average tourist. Getting access to people’s everyday lives is often difficult if you don’t know any locals, especially if it’s your first time at a particular location. Consider hiring a guide or translator so that you can communicate with locals on a deeper level than just knowing the basic phrases. I’ve done this a few times and you sometimes get to make great friends with your guides, who will be happy to introduce you to interesting people and places. When taking pictures of strangers or communicating with locals, don’t be a dour faced tourist. 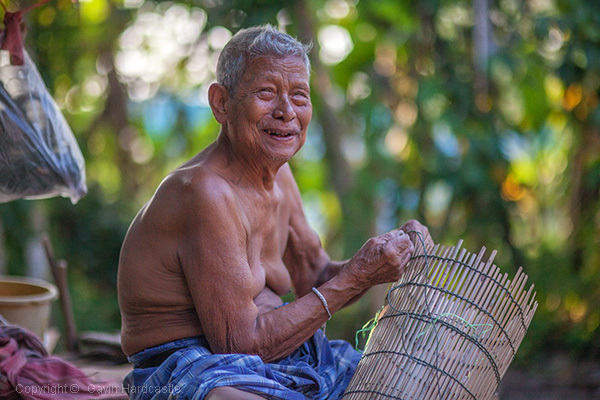 Smiling is universal and softens what might otherwise be an intimidating approach to people who have little experience with adventurous foreigners. If you want people to like you, a smile is a good place to start. If you’re able to ask a person for permission to take their picture, you should. In many countries there is no legal obligation to do so but it’s just good manners, and some people may have religious reasons why they’d really prefer not to have their picture taken. Conversely, don’t interrupt a delicate social situation if there’s a chance it might be socially awkward. This picture I took at the very famous What Pho in Bangkok is a good example. 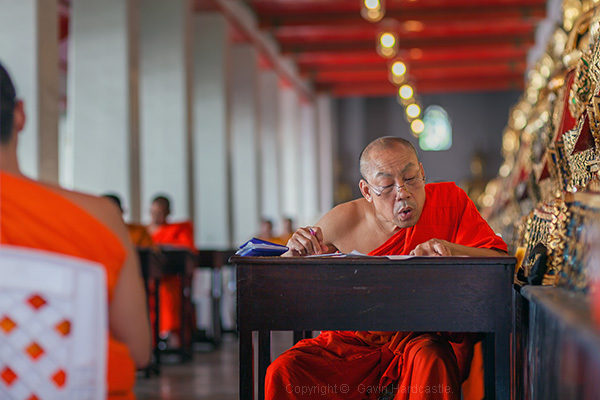 The monks were taking an exam in front of hundreds of tourists under a high pressure situation so I’m hardly going to walk up and interrupt. When it comes to capturing atmospheric cultural shots, I’ll choose prime lenses that offer a lovely blurred bokeh effect while keeping my main subject sharp. Typically these will be in the 35mm, 50mm or 85mm, range on a full frame camera. These types of lenses will give you that lovely cinematic look that all-in-one zoom lenses just can’t deliver. You can achieve a similar look with big telephoto lenses but those are less portable. Smaller primes also make you look more low-key and have great image quality. 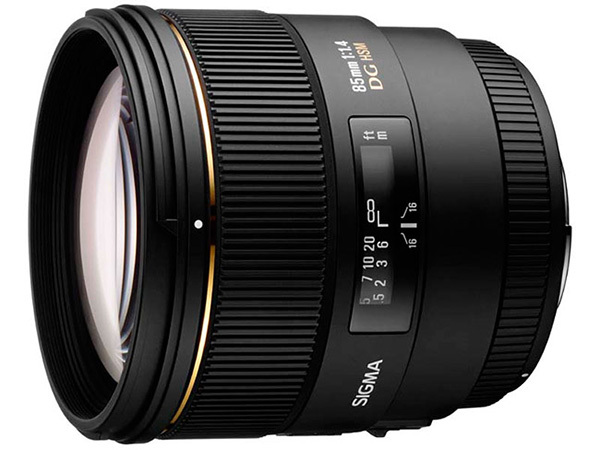 One of my favourite lenses for travel photography is the Sigma 85mm 1.4 prime. This goes back to what I said about shooting fast. With people and animals you often won’t have time to switch lenses, so consider carrying two cameras that have lenses for different purposes. Let’s say a wide angle lens on one camera, and a lovely 85mm prime for portraits on the other. This way you’ll be able to cope with most situations at a fast pace. If you are going to carry two cameras, try and keep one in a small bag at all times. If you look too much like a paparazzo it might intimidate some people. I’m not advising you to put yourself in danger. You should always use common sense, but consider doing things you might otherwise find yourself saying NO to. That’s where you’ll find the best photo opportunities. An example of this would be my recent visit to a mountain cave in Thailand called Phra That Cave in Kanchanaburi Province. 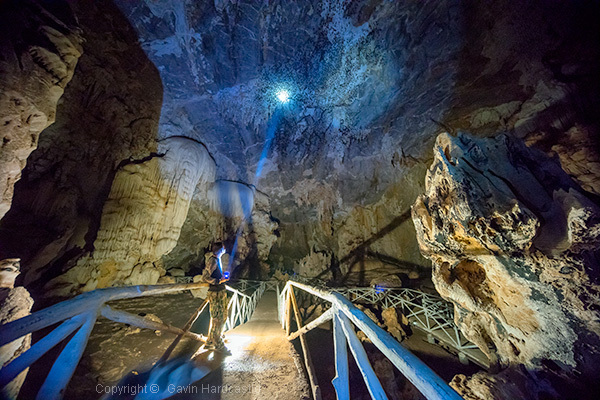 The cave has no lights, claustrophobic tunnels and thousands of bats, some of which you’ll have flying right in your face. To me, that’s fun, but to others it’s a living hell. Third world countries (and even some first world countries) have a very vague concept of Health and Safety. Modern day westerners are raised in a bubble of relative safety that can sometimes result in us having a misplaced sense of responsibility. Use common sense when traveling, and don’t assume that those hastily built steps you’re about to climb have been passed by a safety inspector. I’d love to hear your travel photography tips. From always carrying toilet paper to having your lawyer’s phone number on speed dial, please share your hard earned experiences and let’s grow this tip list. The post 10 Ways to Improve Your Travel Photography by Gavin Hardcastle appeared first on Digital Photography School.